Uniting 7 bundles of 19 wires to produce improved strength without compromising on flexibility, this stainless steel rope is equipped with a popular construction and available with a 9mm diameter. 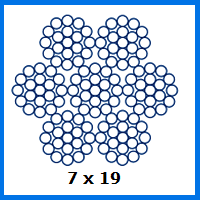 The upshot of 9mm 7×19 Stainless Steel Wire Rope is a load capacity of 4,693kg and a host of other perks that are worth learning more about. As well as the 4.7 tonne WLL, this wire rope comes with a breaking force rating of 46kN. It can be used to make slings, control cables, rigging and plenty of other useful components that harness the impressive corrosion resistance of stainless steel. With a 7×19 construction, this rope is much easier to bend and flex without suffering the fatigue issues which face more rigid examples. If you are looking for a rope that is stronger at this diameter, our 1×19 equivalent could be worth checking out. Rope Services Direct is a great site to browse if you need fittings, accessories and complete assemblies. Furthermore we can pair many of our products with the ropes we produce, including this 7×19 construction stainless steel example. Our rope can make an excellent option when creating balustrades and various other architectural and decorative projects. Along with aiding in lifting operations, such uses are often chosen by our loyal customers. We can talk to you about our rope products, provide a quote and take an order when you call 01384 78004 or send us an email. The RSD sales team is friendly, experienced and eager to help. 9mm 7x19 Stainless Steel Wire Rope Overall rating: 5 out of 5 based on 6 reviews.